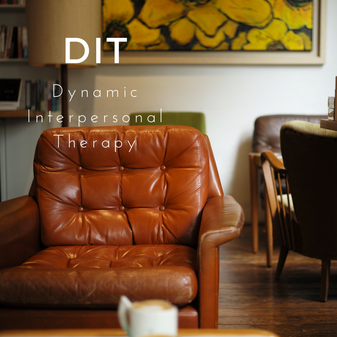 Dynamic Interpersonal Therapy (DIT) is a short-term (16 sessions) psychodynamic therapy model. It was specifically designed to address presenting symptoms of depression and anxiety, but can also be offered and be very useful to treat other problems and disorders. Dynamic Interpersonal Therapy aims to help you understand the connection between presenting symptoms and what is happening in your relationships through identifying a core repetitive pattern of relating that can be traced back to childhood. Once this pattern is identified, it will be used to make sense of difficulties in relationships in the here-and-now that contribute to psychological stress. The core repetitive pattern will be identified collaboratively with your therapist and you will frequently refer to this during therapy. You will increasingly become aware when this pattern is activated in your relationships and be able to test out experiencing things differently, as well as testing out new ways of behaving and being in your relationships. DIT is underpinned by psychodynamic theories, which see relationships as the core of all psychological functioning and suffering. Hence, when a person is able to deal with a relationship problem more effectively, his or her psychological symptoms often improve. DIT is most effective for clients who are interested in becoming more aware of how they behave and feel in relationships and are curious about how this might relate to their psychological suffering. Some of the thoughts and feelings which will be uncovered during therapy might be very new to you, but can be immensely moving and eye opening. DIT was developed by combining those psychoanalytic/dynamic approaches with the strongest empirical evidence for efficacy. It has been shown to be scientifically proven to be effective in the treatment of certain disorders and has been accepted as a model of therapy to be offered in NHS psychotherapy and IAPT services. You can find out more about DIT here.